“I was fortunate enough to have been able to purchase one of the limited-edition Dean Sky Guitars. Even though it was expensive, I have no regrets, and would highly recommend this special instrument to the “right” kind of player/enthusiast. 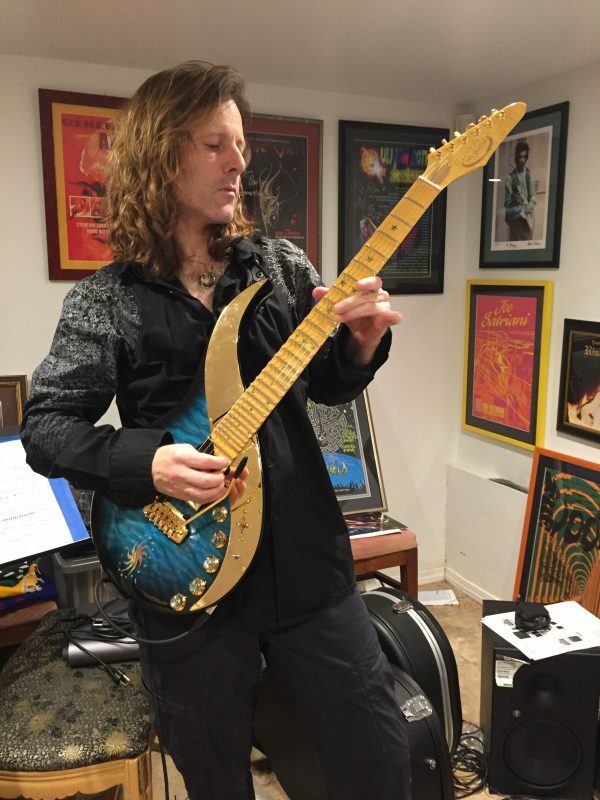 It should be noted that this is not like any guitar you will ever play, and it takes some time and effort to get acquainted for maximum results. My Sky Guitar is the most beautiful and complex guitar I have ever touched. I love the scalloped neck, even though it still feels strange sometimes. My other guitars are Ibanez JEM, PRS, Les Paul and Strat, and none of these have scalloped necks. Like any instrument, it has its own personality and temperament. While I am still on the learning curve with my Sky Guitar, every time I play it, I feel more endeared and attain greater comfort with it. It is really an amazing instrument, and I love it. It is cool that every Sky Guitar produced is unique and differs from the others in some way. The extent of the un-scalloped portion of the neck varies in different Sky Guitars. Mine is scalloped beyond the third fret, and this allows from more easy fretting of open chords in the low end of the neck where it is not scalloped. I also find the LEDs in the neck a cool bonus. The curling of the wood on the neck is just beautiful, and the blue wood finish on the body is gorgeous. In addition to the scalloped neck, the extent of the neck in the high register is such that the fingerboard is over top of the neck pickup. In this area one must pick directly over the fret board. Picking over the higher frets feels a little strange at first, but it gets more comfortable with time. I chose the 6-string version because I am unfamiliar with the 7-string guitar, and will work up to that later. In my opinion, the Sky Guitar is an instrument ahead of its time. While it is rather expensive, I am certain that the main reason for this is that these instruments are very expensive to produce. It was a labor of love that led to the production of this limited edition run of Sky Guitars. I am honored to have one. These Sky Guitars are like a living piece of history, and the craftsmanship is exceptional in every way. Also, it means something to me knowing that Uli has personally become acquainted with, approved and named every one of these guitars. Uli Jon Roth has built his career by being an uncompromising artist, and that is one of the many reasons that I have been a fan for so many years. Just as he has not compromised his artistic visions for gold and silver, he has also demanded a standard of quality with these guitars that is above reproach. I am honored to have a Sky Guitar. It makes me happy that Uli will be continuing to oversee the evolution of the Sky Guitar, and to share it with those of us who appreciate it so very much.